We are not just selling a rife machine generator. Our service is worth more than the software. Our No Rift Rife Guarantee is that you will be satisfied with the quality of our product and our service. Please go to our home page to read more information the the rife frequency generator. You will not only get the Software Generator but we will also give you a wealth of information on how to use this software. You will be able to immediately download the rife frequency generator load it on your computer and with in 48hrs we will send you the generator key code. The software will work for 30 days without the activation key. Program description: This Program can generate square, sine, triangle wave signals for use in researching the theories of the researcher Royal Raymond Rife. ( Rife frequency Generator ) The Frequency Sweep option is also now on the the new software. This is the only rife frequency Generator We know of that can actually do Dual Frequencies and Dual Frequency Sweeps. Once you save your file you can instantly select your choice. Windows 7,8,9,10 and XP/Vista supported. 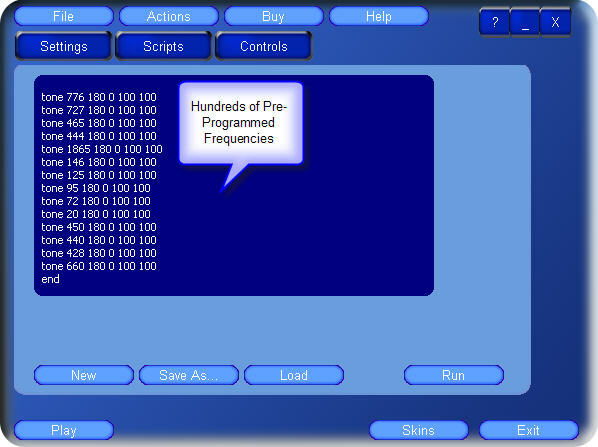 The scripts screen will play frequencies automatically. You get the scripts with the software, You will see a blue screen and all the scripts will play in series. You change the scripts, rename, increase or decrease each the time on each script, and add or change the frequencies. You can also add, rename and save new scripts. Set the amount of time to run each frequency. The settings allow you to get the best frequency tone. After your purchase you will be given a download link for the Software along with detailed instructions on how to use. Program description: This Program can generate wave signals in researching the theories of the researcher Royal Raymond Rife for use as a Rife frequency Generator. The Frequency Sweep option is also now on the the new software. This is the only rife frequency Generator We know of that can actually do Dual Frequencies and Dual Frequency Sweeps. Once you save your file you can instantly select your choice. - Multi sound card support . You can also run scripts. There you will see a list of ailments and a set of Frequencies. Each ailment and frequency set would be considered one script. You can choose Over 600 scripts and play the one you want. Based on Dr. Hulda Clark's research. She believes that parasites cause a variety of medical problems and diseases. She also believes most of us have parasites.